This is part one of a three part trilogy. Each book stands by itself but grows in intensity with each subsequent book. Life: A young computer hacker, Robinhood of the future, discovers our world is manipulated through our thought, created by the governments raising the tax rate to astronomical levels to enslave mankinds thoughts into poverty. Now he must join "The Uprising," to fight the powers, and accept his new role as their leader. Codename: TaxMan, which garnered his name from his eloquent achievement of hacking into the California brown bag tax structure to disperse the money to his offshore account, and other Life's that were off the grid. The government system that is entrenched over the Lifer's eyes has taken their thoughts and forced these Life-Hackers to spring up off the grid that is now the technological dystopian age, coined after the revolution had ended five years ago. The governments across the globe want to eliminate these Life-Hackers and control the population taking more of their tax revenue when they give the TaxMan an ultimatum to program a new application to take more of the Lifers income. This will force more Life's on the street, and he refuses until they take his girlfriend hostage, and his world is flipped upside down where now his choice will be to help the Uprising, the government, or stay true to himself. This is a fast-paced satirical setting that is laced with different elements of conspiracy and thriller. The book commonly asks the same question of what is really going on? Do anyone of us know, or are we all searching in the wrong place? 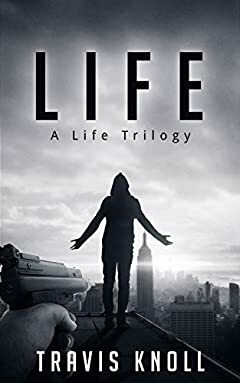 Life is the first book in the Life trilogy thrillers series. The subsequent books are aptly titled Death and Birth. These books are meant to explore Life in a different fast-paced, satirical, thriller, conspiracy style. Purchase today and stay updated for future additions.